Anyone who experiences a significant reaction following immunisation should first seek medical attention from a health professional. While no vaccine is entirely free of potential side effects, the benefits of immunisation far outweigh the risks. Severe side effects from vaccines are rare and common side effects are usually mild and short lasting. 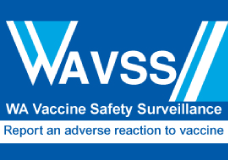 The Western Australian Vaccine Safety Surveillance (WAVSS) system is an initiative by the Western Australian Department of Health to monitor vaccine safety. It is the central reporting service in WA for any significant adverse events following immunisation (AEFI). Although significant AEFIs are rare, WAVSS was established to help healthcare providers and the public to report potential AEFIs and to make sure that people who have experienced a significant AEFI receive the appropriate clinical follow-up. The WAVSS reporting system is now part of the national reporting hub called Adverse Events Following Immunisation – Clinical Assessment Network (AEFI-CAN). The WAVSS reporting website is now redirected to the WAVSS page on AEFI-CAN. There are no changes services or management of WAVSS and all WA reports will be followed up as usual by WA Department of Health staff. What is an adverse event following immunisation (AEFI)? An adverse event following immunisation (AEFI) is an unwanted or unexpected event occurring after the administration of a vaccine. Such an event may be caused by the vaccine or by chance after vaccination (that is, it would have occurred regardless of vaccination). Most vaccines cause minor adverse events such as low-grade fever, pain or redness at the injection site. Read more about AEFIs and vaccine safety. Who can report an AEFI? Health professionals involved in the care of a person who has an AEFI are required to report it. Medical Practitioners in WA have a statutory requirement to notify AEFIs to the WA Department of Health as specified in Regulation 4 of the Health (Notification of Adverse Event After Immunisation) Regulations 1995. You can also report an AEFI using WAVSS if you or someone you care for has experienced an AEFI and needed medical assessment or treatment. It doesn’t matter if more than one person reports the AEFI. It is far better that an AEFI is reported by more than one person than not at all. Should all AEFIs be reported? any significant event following immunisation. any reaction that has affected you or your family’s confidence in future immunisation. Not all side effects need to be reported. Read more about possible side effects of vaccination. How do I report an AEFI in WA? Using an online form at WAVSS (external site). How does the WAVSS feedback system work? The WAVSS system provides patients and service providers who report a significant AEFI with timely feedback. Feedback to members of the public will depend on the severity of the reaction. Where significant events have occurred after immunisation a nurse will call the patient and request further details. What are the benefits of the WAVSS system? access to specialised immunisation clinics for people with a history of a significant AEFI. Can a patient be referred to a specialist immunisation clinic after experiencing AEFI? Although there are some adverse events which prevent some patients having further vaccinations, for example Guillain-Barre syndrome, which is a rare autoimmune condition resulting in paralysis. For many others re-vaccination is possible. Specialised clinical services are available for people who have had significant AEFI where further vaccinations can be discussed or administered under medical supervision. Initial assessments will be carried out at the Central Immunisation Clinic. How will AEFIs be reported to the Therapeutic Goods Administration (TGA)? Medical practitioners in WA have a statutory requirement to notify events after immunisation to the WA Department of Health as specified in Regulation 4 of the Health (Notification of Adverse Event After Immunisation) Regulations 1995. All AEFIs will be reported daily to the TGA by WAVSS staff. Why is it important to collect information about AEFI? reducing the negative impact upon the health of individuals and the WA immunisation program. WAVSS will enable careful and safe monitoring of immunisation reactions in WA, individualised support to immunisation providers and medical assistance for families affected by an AEFI. The clinical follow-up service provided by WAVSS seeks to increase the confidence of patients and immunisation providers to continue with the immunisation schedule even after AEFI has been experienced and reported.